Tackling neglected tropical diseases such as helminth infections. As a testament to our commitment to improving access to medicines, our Health for Humanity 2020 Goals include targets on expanding access. For more information on progress made against these commitments, see Health for Humanity 2020 Goals Progress Scorecard and World Without Disease. In the United States, we offer Janssen CarePath, which provides access, affordability, and treatment-support resources to help patients get started on, and stay on, the Janssen medicines their healthcare providers prescribe. In 2017, we helped approximately 1.2 million patients through the Janssen CarePath Program. This includes approximately 610,000 commercially insured patients who reduced their out-of-pocket expenditures through the Janssen CarePath Savings Program. For more information on access and investments for our medicines in the United States, please see the 2017 Janssen U.S. Transparency Report. In many instances, challenges with the delivery of care or products—not the cost or price—create the most significant barriers to access. To address this, our Global Public Health (GPH) and Global Community Impact Programs focus on non-price barriers to access, including capacity, capability, infrastructure and medical education. 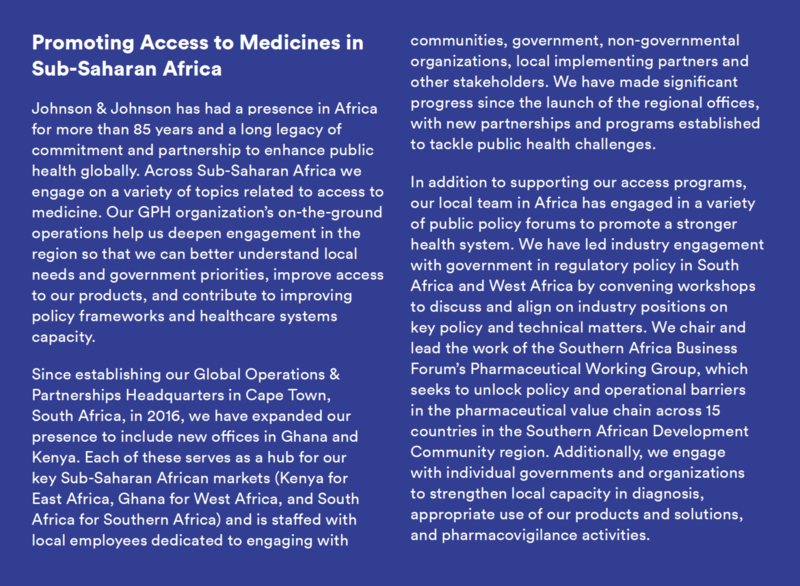 This includes: capacity through trainings, exploring local innovation and research, and strengthening supply chain to ensure that products can reach patients in need. As an example, for our Bedaquiline Access Program, in addition to donating the drug, we provide support on proper administration, as well as use and safety monitoring to local healthcare providers and regulatory authorities. In 2017, Janssen—together with the National Tuberculosis Program and Ministry of Health in South Africa—hosted several training sessions related to the safe use of bedaquiline, including training in pharmacovigilance and risk minimization activities, as per World Health Organization Guidance. The Access to Medicines Foundation's Antimicrobial Resistance (AMR) benchmark report recognized our efforts to promote broad but appropriate use of bedaquiline as the most comprehensive of those specifically linked to any single AMR product. For more information on additional efforts related to strengthening healthcare systems, including training frontline health workers, visit Strengthening Health Systems section. Access to healthcare challenges are complex and multi-faceted. Addressing these requires concerted efforts by multiple stakeholder groups across the healthcare continuum. We are committed to working with governments, donors, non-governmental organizations, multilateral organizations, and other stakeholders to advance access to care. Together, we foster innovative approaches and increase access to new medicines and new technological solutions. We set a strong foundation for partnerships, which may include licensing agreements guided by terms that address public health needs, and we aim to mindfully reflect our commitment to a pro-access legal environment. For example, going forward, our contracts will strive to incorporate several pro-access terms identified by the Access to Medicines Foundation in the 2016 Access to Medicines Index. In 2017, we were proud to join the Access Accelerated partnership, a first-of-its-kind global initiative addressing the rising threat of cancer, diabetes, cardiovascular disease, mental health disorders and other non-communicable diseases (NCDs) in low- and middle-income countries. The partnership gathers a broad group of stakeholders, including the World Bank, the Union for International Cancer Control, and pharmaceutical companies with a shared vision of working towards the UN Sustainable Development Goal target to reduce premature deaths from NCDs by one third by 2030. The initiative will focus on access to primary healthcare, as well as financing, regulatory and service barriers.